Line 13- x 9-inch baking pan with parchment paper. Divide white chocolate into two equal portions. Stir green food coloring into one portion and orange food coloring into remaining portion until desired hues are achieved. Spread semi-sweet chocolate evenly into bottom of pan. Pour green- and orange-colored white chocolate over top; using a toothpick, wooden skewer or butter knife, swirl chocolate together to create decorative pattern. 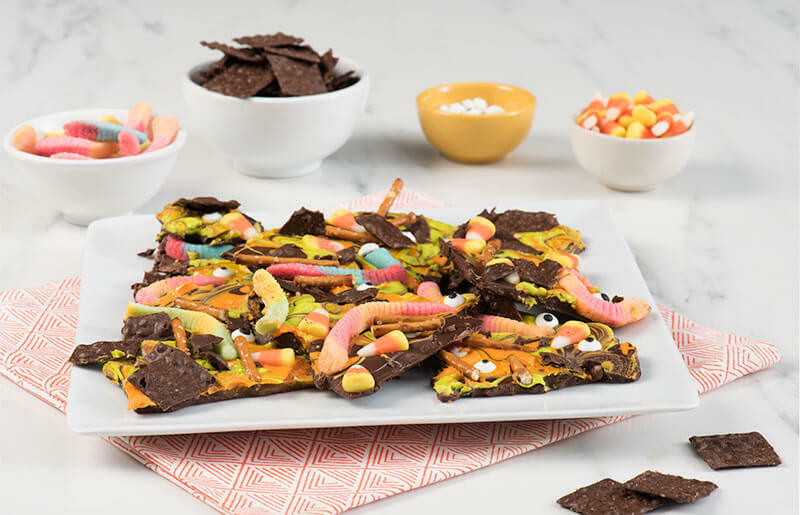 Sprinkle chocolate thins, pretzels, gummy worms, candy eyes and candy corn over top; gently press toppings into melted chocolate. Refrigerate for about 2 hours or until chocolate is set. Remove from pan and peel off parchment paper; break bark into pieces. Store in airtight container for up to 1 week. Tip: Use lightly crushed yogurt-covered gluten-free pretzels to resemble broken bones.